If you like to play poker online, then chances are you've already wondered about where to play. Should you choose the most popular poker rooms? Or are sites with fewer players better? There are a tonne of poker sites to choose from whether you're in Canada or The States, so how can you make an informed decision? Ultimately, what this all comes down to is traffic. And unlike commuting to work, you want the highest traffic possible when you play at online poker sites. The reason for this should be obvious, but if you're new to the concept of highest traffic poker sites, we'll walk you through it. In a nutshell, the more people who are playing, the better chance you have of finding a game that meets your criteria. Additionally, many of the top real money sites also have a greater selection of games. April 2019 Update: Governor of Poker 3 rises to the top in our latest series of site reviews. Certainly Texas Hold'em is the most popular poker game. Nearly every top poker site is going to offer several poker rooms dedicated to the game of Hold'em. That is to be expected. But, smaller sites will probably start and end their game selection right there. That means no Seven Card Stud, no Omaha, no hi-lo and other pot-splitting games. Chances are high that there are games on the list above you don't even recognize, and many of the most popular poker sites offer plenty more. That in itself should be a testament to the range offered at some of these top real cash sites. Remember that these top poker sites are not running a charity. They are big business. When traffic is high, this means they are having a lot of money run through their coffers. With this money comes more promotions. Many of the best online poker sites do give their players bonuses for signing up and depositing money. They also are then able to take some of the profits and create interesting and unique promotions. Think of satellite tournaments where the winner ends up with a free seat to one of the larger brick and mortar poker events. Basically, the more traffic a site is able to gain, the better job they can do with their marketing efforts. This is why there are advertisements for some of the most popular sites on TV and all over the Internet. It's all of that real cash that makes the wheels turn on this. If you have ever signed up for a real money site, then you are already part of this system! There seems to be two main types of poker plays these days. There are those who only play real cash games and those who prefer tournaments. It is not a coincidence that sites with the highest traffic also have some of the most desirable tournaments. From a business perspective, the tournaments are really all about marketing. 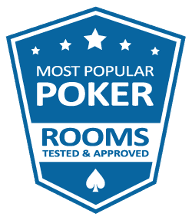 If one of the most popular places in the poker world announces a great new tournament, they are doing so in the hopes that more people will visit their site to check it out. And that means more traffic and more money. Tournaments are simply an investment by these large and top online poker sites. The higher their traffic numbers, the better prize pools they can put together. As these prize pools improve, more and more people will be attracted to the tournament. It is a cause and effect relationship that all starts with a base of high traffic. On the other end of the poker spectrum, you have those who prefer playing real cash games. While this is certainly a different skill than playing in a tournament, both types of players are helped by higher traffic levels. In the case of a cash game, a site with a lot of traffic means you are not likely to wait for a game to start. In other words, your stake level is more likely to have enough players to get things started quickly. 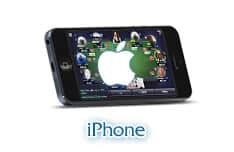 Another consideration having to do with traffic and cash games is that this will make it much easier for you to progress to higher stake levels. If you play at a site without a lot of traffic, you still may be able to find games at lower stake levels. However, there will come a point where you simply have gone as far as possible. 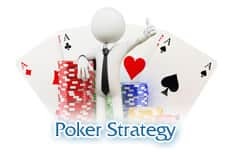 Higher traffic sites will not encumber your continued progression through the poker world. The name of the game when playing poker is to find those 'fish,' other players who are not as good but think they can play (and who also have the money to do so). With a high traffic poker site, their popularity continually attracts new fish to the ranks. It is easy for some businessperson sitting in their office to create an account and read a book about Hold'em. Once you learn how to recognize a fish on the highest traffic sites of 2019, you can really increase your winnings. This is simply something that can't be done on sites without traffic. 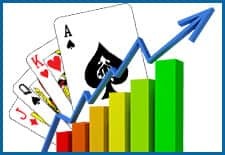 That businessperson described above has heard about the big poker site, since it is advertised all over (remember the higher traffic means they can do a lot more advertising). He hasn't heard about the tiny sites, since they can't afford to advertise very heavily. 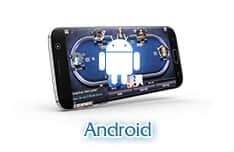 Therefore, get off of those smallish poker sites and start playing online poker at those most popular top sites. What sort of features do the most popular poker sites have? The best poker sites have a high number of players, a wide selection of games, higher payout rates and amounts, more promotions. It all comes down to the fact that the more players there are, the more money the casino has to give you the game choice and promotions you want. Will the poker games have softer competition? It depends. While popular poker rooms will have plenty of strong, crafty players, they will also have lots of ‘fish’: players who think they are good but are not that good, while they have the money to play as much as they want. Such competition is good for you, as it allows you better chances to win often. What will the range of stakes be like at popular casinos? The range of stakes depends on the rooms you pick, but popular casinos often offer a full range of stakes from a few cents to thousands of dollars. Low-level poker rooms accept tiny bets, while high-level poker rooms play for high stakes. You will definitely be able to find your most comfortable range somewhere. Do the popular sites offer better bonuses? 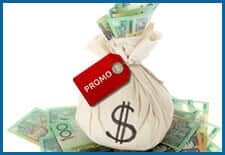 Yes, popular sites have more traffic, and thus more money to offer you better bonuses and a higher number of quality promotions. Is the selection of games better at the popular sites? Yes, the more popular the site, the wider the game selection. The main thing to remember from this is traffic equals money. Not only for the most popular sites, but also for you, as a skilled online poker player. Learn how to recognize the fish, keep practicing and you can make decent money in these top poker rooms.